Commercial Asphalt Paving RI MA - Nu Look Inc. The installation of a new parking lot can be a substantial financial investment, so you should expect the best quality from your contractor. 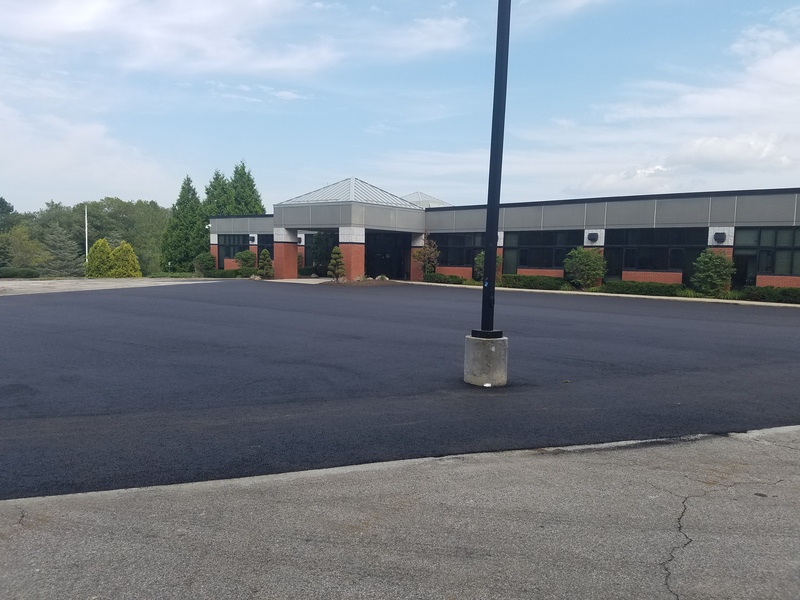 Utilizing proper construction methods, a newly paved parking lot in New England should last approximately 30 years, depending on the nature of the traffic it withstands, and with regular sealcoating. 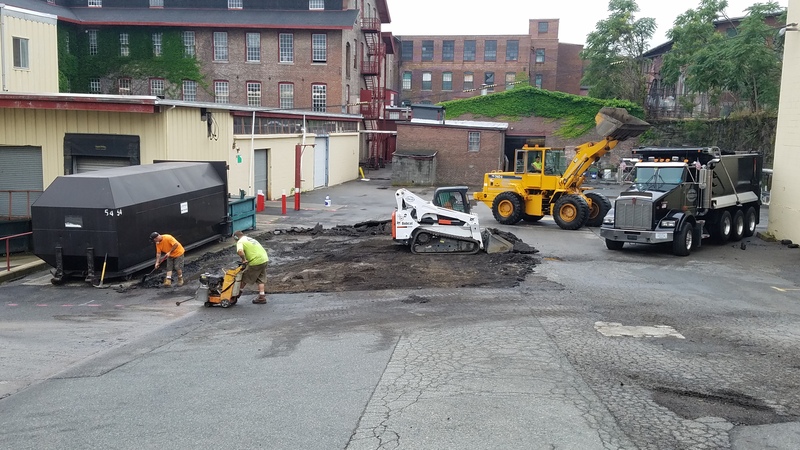 There are several steps involved in the removal and replacing of a pavement structure, and each step is crucial to the long term success of the asphalt. If any procedure during the installation process is done short of just what is required by industry standard practice, it will greatly decrease the durability and life expectancy of the pavement. 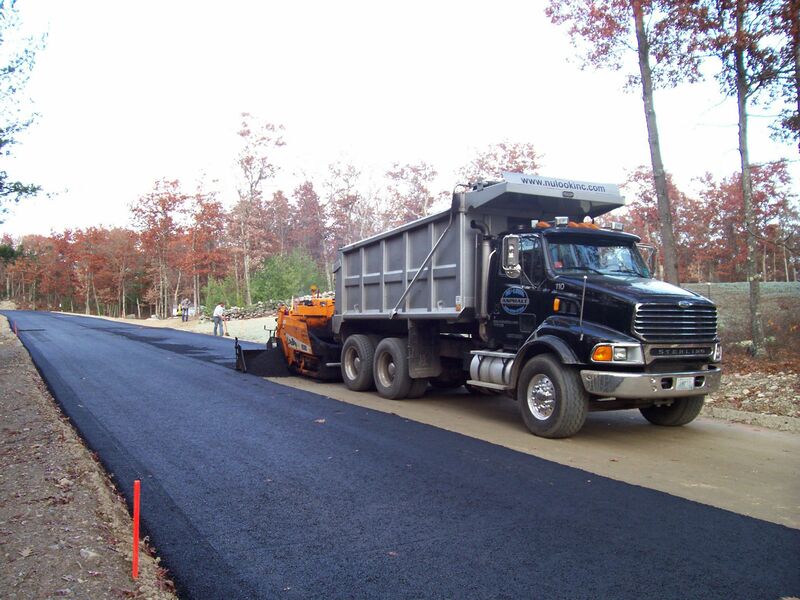 As one of the most experienced commercial asphalt paving companies in Rhode Island ( RI ) and nearby Massachusetts ( MA ), here is what you will receive when contracting with Nu-Look Asphalt. Step #1: Excavation of existing material. An asphalt structure is only as good as what's underneath it. Paving over soft ground or on top of damaged asphalt will surely cause the new pavement to crack and fail. The underlayment of gravel we install and compact provides the base for which the pavement will be laid upon, and the proper preparation taking place in this step is essential for the durability of the pavement, and it is what sets quality contractors apart from the rest. As we state in all of our estimates, all unusable material, be it older asphalt, concrete, or organics if it is a new construction, will be dug out and removed from the job site. In many cases, we need to dig down up to one foot if we are removing loam, stumps or other soft material. We will always contact DigSafe as required by law, to indicate the location of underground utilities, as we may need to excavate as deep as these structures are. Also, in most cases, paving over your existing parking lot is not a good idea as it doesn't allow us to correct sub base concerns. If you have significant cracking or sunken areas, they will likely reflect upward into and through the new asphalt within a short time period, or continue to sink and fail if the stability of the gravel is not addressed. Concrete can never be paved over with asphalt. We are well equipped with excavation equipment, front end loaders, skid steers, and dump trucks to haul away this material. Step #2: Installation of base gravel and grading of surface. The proper installation of the base of material beneath the asphalt provides the foundation for the pitch and durability of the overall structure. We use on average 4" to 6" of recycled asphalt product (R.A.P. ), depending on the conditions and the existing material. This product, most often spread by a skid steer or run through the paving box, is engineered specifically to be laid beneath asphalt, compacts very well, and is set at the proper pitch to allow for sufficient water drainage. Grading the gravel base correctly allows for easier asphalt paving to occur later. When necessary, we will use a laser level or transit to ensure pitch, so that water is channeled in the most appropriate direction. The gravel is then rolled with a vibratory roller, and next it is gone over once again with a hand compactor. Step #3: Purchase and laying of hot mix asphalt. Once the surface is properly prepared, Nu-Look sends its fleet of dump trucks to the nearest asphalt mixing plant to purchase the freshly batched hot pavement mix. When necessary for larger projects, we hire additional trucking to make sure we have hot material on site at all times. Having the proper trucking capacity allows us to remain operative and productive, and minimizes material cooling and down time. When paving a parking lot, the asphalt is laid in two levels, or lifts. The first lift is called a binder course, and consists of a larger stone with greater strength. The second lift, or top coat, has a finer stone and provides a clean finished look. Nu-Look uses state of the art paving equipment in order to provide the highest quality finish. Our paving machine, a LeeBoy 8510, was purchased new in 2012 and has received the highest level of continuous maintenance available. Having the best equipment is further assurance that your new driveway, installed by Nu-Look, will be the best it can be. Step #4: Compaction and the finished product. 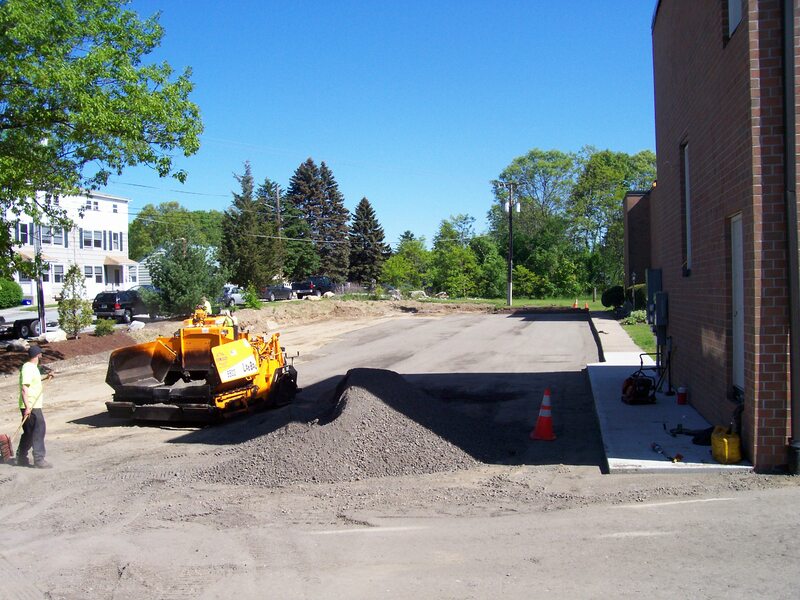 A most important and final step in the paving of your parking lot is the compaction process. Without proper compaction, the asphalt structure will not hold together and endure season after season, as needed in New England with our weather patterns. Upon the laying of each lift of asphalt, as with the base gravel, the surface is rolled with a vibratory drum roller, and then further compacted with a hand compactor. Any edges which do not abut another pavement surface are hand tamped to provide a 45° angle, providing the necessary strength to support vehicle weight. When your driveway abuts an asphalt street, the joint is always sawcut out so the two surfaces meet flush underground. A sure way to break off the edge of a pavement structure is to "skim coat" it to a thin layer over the neighboring surface. This results in asphalt that is too thin to support sufficient weight, as well as allowing snowplows to lift it up. Once the process is completed, your Nu-Look installed driveway will be durable, attractive, and will improve your value of your property. Please contact our company for all of your commercial asphalt paving needs in Rhode Island ( RI ) and nearby Massachusetts ( MA ).